Now, who doesn’t just love this verse? What a promise from God! Is this really a “blank check” from God? For myself, depending on the moment, I have had multiple desires. Most of them, however, never came into fruition. Why not? As always, the Word of God has the answers to life’s questions. We will use this passage from Psalms as a base for this present study. When studying any passage of scripture, it is absolutely necessary to consider it in its proper context. The context may include cultural, historical, and grammatical aspects. Paul admonished young Timothy to “study to show thyself approved unto God...rightly dividing the word of truth”. Let’s look again at this beloved verse in Psalms. The Hebrew word for “delight” actually means soft or pliable. So, one could paraphrase this word as yield. 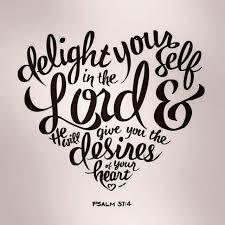 Yield thyself also in the LORD: and he shall give thee the desires of thine heart. In 1934, there was a popular Mexican songwriter, Maria Grever, who composed a song which was later made famous in 1959 when it was sung by Dinah Washington, “What a Difference a Day Makes”. I thought of this song when I considered this thought, what a difference a word makes. As we continue this study, the impact and truth of this word will become more evident. This comment made by Jesus is very reminiscent of the verse in the Psalms. Jesus was what is known today as an itinerant preacher, in other words, he traveled from place to place preaching the Good News. Undoubtedly, he used the same sermon notes, figuratively speaking, as he addressed different crowds from village to village. The disciples became well versed in these sermon truths. We shall now see how two of these disciples understood Jesus’ teachings regarding this promise. These two sons of Zebedee used the exact words that Jesus used when he gave the promise. You have heard the expression, “you can take it to the bank and cash it”, when one wants to emphasize the truth of what is being said. This is exactly what James and John were doing, cashing in on a promise. Jesus then asked them what was their desire (as if he did not already know). Yes, God knows our very thoughts, desires, needs and petitions, yet he wants us to ask him. What was wrong with their request? They just wanted to be near Jesus, right? They didn’t ask for wealth, fame or long life. It was a spiritual request. What was Jesus’ answer? Basically, no! Does this mean that Jesus’ promises cannot be relied upon? Of course not. No, what James and John asked for was selfish and prideful. Think back at the last night that Jesus and his disciples were together before he would be taken to Pilate’s palace to be questioned on that fateful night leading up to his crucifixion. It would be known as the Last Supper. After that somber and heart-rendering experience, what do we find the disciples doing….arguing about who was the greatest disciple among them. How petty. Sadly, we are no better, in fact, we are much worst. In trying to discern God’s truth, we must consider his whole counsel. We cannot just take one or two passages and come to a conclusion. No, we must consider all scriptures that speak to that issue. This certainly seems to be the case with our two disciples in question. There must be something more, something missing in this consideration of Jesus’ promise about giving us the desires of our heart. Again, we turn to the Word of God for direction. I think we have found our answer, “according to his will”. Look at all the familiar phrases in these verses that are found in the other passages of promise. Jesus probably even used this same phrase according to his will in his earlier sermon notes, but what was recorded previously was the Reader’s Digest version. Notice, too, who is writing this epistle. Yes, it was John. With age comes wisdom. John had finally learned to listen to that “still, small voice” in his heart to find direction. He was not listening to his carnal, selfish voice anymore. How did he finally learn how to do this? The truth has finally arrived! It is God who actually puts his will within our hearts, so that we may pray according to his will. Then, it is God who answers (to do) our petitions accordingly. The great apostle Paul gives us a little more clarification regarding this mystery. The truth of Jesus’ promise is much more clear. There are still some things that are not so evident and clear. How does a believer attain to that place in God where he can ever really know God’s will or the mind of God? Is it even humanly possible on this earth? According to God’s Word, it is. In fact, it is God’s desire that all believers come to that completeness in Him. In another study, we will look more closely at this idea.